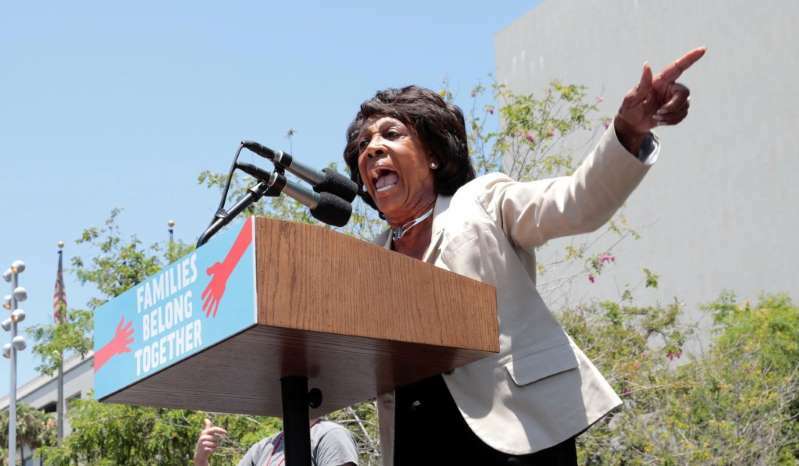 © Monica Almeida/Reuters Congresswoman Maxine Waters (D, Calif.) during a national day of action called "Keep Families Together" to protest the Trump administration's "Zero Tolerance" policy in Los Angeles, Calif., June 30, 2018. Republicans, independents, and thinking Democrats who wonder why they should go vote GOP on November 6 should visualize this: Senate Judiciary Committee chairman Dianne Feinstein and House Financial Services Committee chairman Maxine Waters. If Democrats capture either or both chambers, key congressional panels would fall to far-left lawmakers. The macro effect is staggering. Among ten top Senate committees, the average lifetime American Conservative Union rating for today’s GOP chairmen is 85.3. Assuming that current ranking Democrats became chairmen, their average ACU rating would tumble to 7.1. In the House, across 10 top committees, the equivalent ACU averages would plunge from 88.6 to 5.0. Translation: Loud Democrat demands for higher taxes, bloated spending, spools of bright-red tape, and ferocious digging beneath every rock in the Trump administration. • The Senate Judiciary Committee chairmanship would shift from Charles Grassley (R., Iowa), with an 83.8 ACU rating, to Feinstein, a California Democrat. ACU: 8.8. This would promote Supreme Court Justice Brett Kavanaugh’s chief character assassin. Feinstein tried and failed to whack Kavanaugh with last-minute, unsubstantiated sexual-abuse charges. Despite his confirmation, Feinstein is not finished. She said Wednesday: “I’d be in favor of opening up the allegations, absolutely.” Feinstein would activate the anti-Kavanaugh machine anew. Meanwhile, with two Supreme Court justices, 29 circuit court judges, and 53 district court jurists added to the federal bench, judicial confirmations are one of President Trump’s and the GOP Senate’s most encouraging achievements. This progress would grind to dust under Feinstein’s gavel. • The Senate Budget Committee’s leadership would move from Republican Mike Enzi of Wyoming (90.9) to Vermont Socialist Bernie Sanders (6.7). • The Judiciary Committee’s chairmanship would devolve from Virginia Republican Bob Goodlatte (93.8) to New York Democrat Jerrold Nadler (2.7). House Democrats are obsessed with impeaching President Trump. Why? He defeated Hillary Clinton. How dare he? Judiciary would be Mission Control for impeachment. How fair and impartial would Nadler be? Hint: He boycotted Trump’s oath of office. • GOP Intelligence Committee chairman Devin Nunes of California (85.1) would yield to California Democrat Adam Schiff (4.8). Schiff told CNN: “I’m proud to be one of the bad hombres,” whom President Trump has denounced. Schiff likely would torpedo today’s probe of Hillary Clinton’s and the Democrats’ apparent collusion with Russians to excavate dirt on candidate Trump. Likewise, Schiff probably would ignore Hillary’s approval of the Uranium One deal, which let Moscow purchase 20 percent of U.S. uranium supplies, evidently in exchange for $145 million in donations to the Clinton Foundation. This scenario is spookier than Halloween. Election Day arrives one week after that. Voters should run scared to the polls and stop this horror show from happening.